The year 1876 marks the onset of Dr. Gray’s debilitating illness. He had the first of a series of operations in March, to correct a problem (according to Mrs. Gray) stretching back “these 30 or 35 years past.” While he would live another four years, the diarist’s husband was henceforth rarely free from pain. Another feature of the Gray diary from this point is the comparative failure of Dr. Gray’s brother, William Gray (1810–1892), who had hitherto been a mainstay of the family, his wealth and generosity easing things for Dr. and Mrs. Gray and their children. Boston, Tuesday, 13 June 1876: Wrote yesterday to decline Sallie Gray’s very kind invitation for Doctor and myself to make them a visit [in Brookline], beginning next Thursday. At first, Dr G. was much pleased at the idea and felt sure he should like to go. I knew his courage would fail ere the time came – but I encouraged him all I could; …yesterday he decided it was quite impossible for him to leave home. He is so miserable and so dependent for what comfort he has on the absolute ease & freedom of home & home conveniences that I feel sure it would give him more worry & harm to find himself a guest, even in his brother’s family, than any good he would get by the change of air & scene… It is doubly kind of them to ask us just now – for a guest so entirely invalided is a burden, however welcome a one. And they already have so much to depress them out there in dear Isa Loring’s increasing blindness and her natural distress at the loss of 4/5th of her property, by the failure of the Atlantic Cotton Mills. In Wm Gray’s own disordered health and the wear of mind & nerve upon him as treasurer and selling agent for these Mills, to wh. he has given his best powers & judgment these 25 years past – only to see this miserable outcome of it all: stock selling, if sold at all, for 19 or 20 dollars and the whole thing at a dead stand… W.G. has a large part of his own & the family property in this mill. We hear that young Amory Codman has died of malarial fever in Rome – he was their only son – about Rege’s age. They have now only the daughter Pinkie. Sunday, 24 June 1877: Our old neighbour & friend Wm. B. Richards died yesterday at 6 a.m. after 3 months illness – he sank very rapidly within a few days. A good, worthy man. He leaves a wife (Cornelia Walter) and two children – and a property much impaired by his brother Reuben A.R.’s disastrous failure which ruined Reuben & George [Richards] and swamped some $70,000 for William! who however will leave enough to support the family comfortably. Entry for 30 March 1876. Dr. Francis Henry Gray (1813–1880) married Hedwiga Regina Shober in 1844. All entries from the Hedwiga Regina Shober Gray diary, R. Stanton Avery Special Collections. 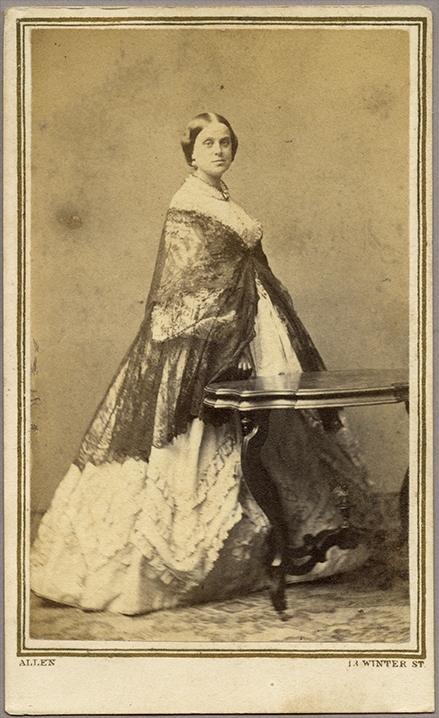 Sarah Frances Loring (1811–1892) married William Gray in 1834. Sallie Gray’s sister, Isanna Elizabeth Loring (1814–1900). Dr. Gray’s brother, Frederic Gray (1815–1877). The diarist’s elder sons, Francis Calley Gray (1846–1904) and Samuel Shober Gray (1849–1926). John Amory Codman Jr. (d. 1876), son of Mr. and Mrs. J. Amory Codman. Mrs. Gray’s third son, Reginald Gray (1853–1904). Martha Catharine Codman (1858–1948), who married Maxim Karolik in 1924. See also a previous reference to Pinkie Codman’s apparent elopement in 1875. William Bordman Richards (1815–1877) married Mrs. Gray’s friend Cornelia Wells Walter in 1847. Dr. George Edward Richards (1845–1919), a younger half-brother and a friend of Mrs. Gray’s son Frank. Dr. Gray’s brother, Horace Gray of New York (1821–1901). The household of the younger Gray siblings at 22 Mount Vernon Street; the William Grays lived at 20. Fred Gray died on 1 August. The diarist’s youngest son, Morris Gray (1856–1931). Dr. Gray’s aunt, Eliza Caroline Clay of Savannah, Georgia (1809–1895). At 1 Beacon Hill Place, around the corner from the other Gray households on Mount Vernon Street. I am enjoying your series of excerpts so much, and look forward to each installment. Becoming aquainted with this lady is giving all of us a much deeper understanding of daily life for everyone in this time. She was, I think, an exceptional person; I find her charming, dignified and courageous. Hopefully NEHGS will publish her story as a book. Thank you! Of course I agree! !